is an American Rock Musical. 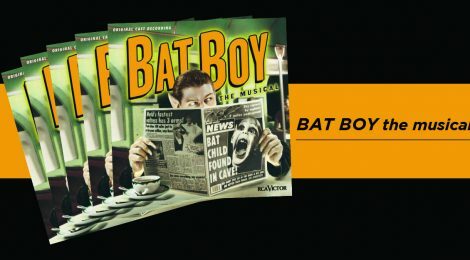 Based on a story in The Weekly World News, BAT BOY: THE MUSICAL is a musical comedy/horror show about a half boy/half bat creature who is discovered in a cave near Hope Falls, West Virginia. For lack of a better solution, the local sheriff brings Bat Boy to the home of the town veterinarian, Dr. Parker, where he is eventually accepted as a member of the family and taught to act like a “normal” boy by the veterinarian’s wife, Meredith, and teenage daughter, Shelley. Bat Boy is happy with his new life, but when he naively tries to fit in with the narrow-minded people of Hope Falls, they turn on him, prodded by the machinations of Dr. Parker, who secretly despises Bat Boy. Shelley and Bat Boy, who have fallen in love, run away together from the ignorant townfolk and have a blissful coupling in the woods, but their happiness is shattered when Meredith arrives and reveals a secret. Soon the entire town arrives and hears the shocking story of Bat Boy’s unholy origin. “Big laughs…It’s remarkable what intelligent wit can accomplish—a jaggedly imaginative mix of skewering humor and energetic glee.” —NY Times. “Smart, playful and funny…a giggling cult hit” —NY Magazine. “Outrageously silly and totally charming.” —NY Daily News. “At the end of the show, you’ve been gleefully, outlandishly entertained.” —NY Newsday. “Composed with smarts, staged with savvy and performed with gusto, BAT BOY: THE MUSICAL is a winner. You’d be batty to miss it.” —Star Ledger.